Harvard University sits atop the Ivy League football standings this year at 5-0. Meanwhile, Princeton is 3-2, Penn is 2-3, and Cornell and Dartmouth are 1-1. Brown, Columbia, and Yale are all 0-2 in league play. The Ivy League began as a football league and so let’s check in to see how the 2012 Ivy League football season is progressing. Going into today’s games, Harvard University, Princeton University, and the University of Pennsylvania are atop the Ivy League with 2-0 records in league play. Harvard is 5-0 overall this season, while Princeton is 3-2 and Penn is 2-3 (these records include games outside of Ivy League play). Behind these three teams are Cornell University and Dartmouth College with 1-1 records in Ivy League play. Both Cornell and Dartmouth have identical overall records as well at 3-2. Next comes Brown University, Columbia University, and Yale University — all of whom are 0-2 in Ivy League football play this season. Brown is 3-2 overall on the year, while Columbia and Yale sit at 1-4 overall. Both Columbia and Yale have lost their last four games (so much for starting 1-0!). On the other end of the spectrum, Harvard obviously has a 5 game winning streak going for itself, and Princeton has won three straight. Penn, Cornell, Dartmouth, and Brown haven’t been able to string consecutive wins together in their last couple of outings. 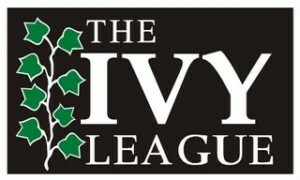 Who do you think will claim the 2012 Ivy League football title? Do you think Harvard’s win streak will hold throughout the season? Are they on the verge of an undefeated season? And why do you think Yale is slumping so much this year? Let us know your thoughts and give us your predictions on today’s contests.